I’ve had the pleasure of running a blog about my favorite hobby, scotch, for many years (first post was December 2008) and I’ve never run a giveaway. Stunning, right? 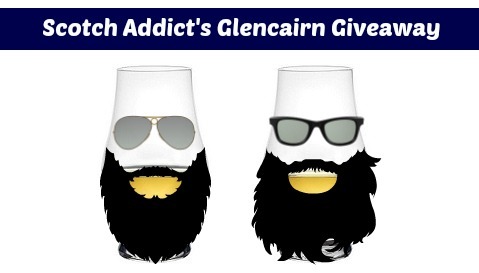 For the next two weeks, we’re going to run a giveaway with a fantastic prize – a Set of 2 Glencairn Crystal Whiskey Tasting Glass! I have several of these and they’re based off the design of glasses in whisky tasting labs. The glass is sturdy with a heavy glass base that keeps it balanced in your hand. It’s impossible to tip over, because of where the weight is distributed, and the tulip shape directs the lovely aromas of whisky right into your nose. Of the various whisky glasses, these are my favorite. Only two steps for your official entry to win the finest in whiskey enjoyment vessels. I send you hand written emails about the enjoyment of the Scotch and other fine spirits, but mostly whisky. Aweber may be down now, if you are having problems, shoot me an email! You must do one of these to gain an entry. There are several ways to gain entries – liking us on Facebook (the only “required” entry Some have emailed me to say you don’t use Facebook, so I removed the requirement), leaving a comment on this post (Answer: What is your favorite whisk(e)y? ), following @scotchaddict, and tweeting about the giveaway. You can only do each entry once, except for tweeting, which you can do every single day. Giveaway ends March 7th, 2014. US entrants only please. Void where prohibited. If you have a question, please email me. I love crystal of all kinds so this could be an excellent treat. I enjoyed your article about your favorite scotch glasses and look forward to the concentrated aroma these Glencairn glasses provides. If I don’t win I may just be tempted enough to buy a couple anyway. I’m a beginning scotch drinker. I started out with Macallan which has led me to love Balvenie, Glenfidditch, and Glenlivet, and Oban. Lagavulin is too peaty for me but maybe I’ll grow into it. MY scotch exploration continues with gusto – I found a great nearby spirit store with surprisingly excellent pricing (30 bucks less on one bottle than the very same at my previous place) and a dedicated scotch man. My new favorite is Dalmore, a smokier scotch and a departure from my usual highlands preferences. Here’s the funny thing about scotch… the smaller stores don’t know what they have and sometimes they order it, it sits on the shelf, and they now want to get rid of it. That’s how you find the gem pricing. I always wander to the scotch aisle of any store I visit, even if it’s a tiny one where I don’t expect much of a selection. You never know if you’ll get lucky! Dalmore is great, so are all the other names you mentioned. Glenlivet 12 was my first foray but Balvenie DoubleWood sealed the deal for me in terms of love. My favorite scotch is Highland Park 18 year old! Favorite right now is Glengoyne 21. (But it really is whatever is available and if I am in a petty or not mood). I’m all about trying new and different. I was originally a chivas and johnny walker fan, went to a friend’s house and had Oban for the very first time and have never looked back since. So much so that I am now buying a little bar for the house to store my treasures in. 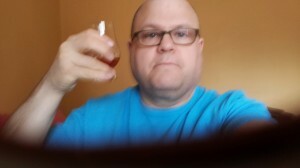 I enjoy any single malt I can get my hands on but oban and lapghroy (hope I spelled it right) are my two must have along with talliskar…cheers gang, or should I say raise your drama to a loud saliente. My favorite whiskey is a bourbon (!) by the name of Blanton’s. Great tasting bourbon with a smooth experience all around. I’m just getting into bourbon but I’ve heard good things about that one. I tried good quality bourbon for the first time the other day (before I had only had the cheap crap found around college). Elijah Craig, aged 12 years, and delicious. Took a couple glasses to get into the taste as I’m so used to scotch whiskey, but I’m gradually becoming a fan. I did the exact same thing (and Elijah Craig) and it’s growing on me. It’s the sweetness that catches me off guard but it’s definitely growing on me. I love your blog, you’ve guided me to some excellent Scotch purchases. We’re halfway through the Auchtenoshan Three Wood, thanks! I enjoy Johnny walker Gold Label 18 year old . True it is a blended malt but I love the peaty flavor ! This is a great Blog by the way ! Well Done !!!!!!!! I am hoping to win a pair of glasses as I have read that the Glancairn style enhances the aroma of Scotch and I do not and can not even imagine putting ice cubes into such a premium beverage as a single malt. I thought ice cubes were an American aberration. My favorite scotch is not possible as each day ends with a different evening’s reflection. That is why it is actually foolish to declare any scotch a favorite other than it be a single malt. Langavulin is floral and Ardbog is intensely spirited. Pick one. Then there is Highland Park 25 year old. I may never win anything, but, my favorite scotch is the one in my glass that evening to celebrate one more day of life having been granted to me. I will be fully honest with you I am a single malt newbie. That said however I do have friends who I seldom see, but when I do they provide me with what they have at the time. In all my trials and travails, I have come to truly appreciate the UK Glenfarclas 15 year old which can be seen on ralphy.com or at least that is where i saw a review on it. Anyhow how it crossed onto American shores I do not know because allegedly this is a UK only release, but I have to say of all those tried including whiskies far more expensive and renown this little gem (which I have tried only 2 drams of) is perhaps the one I would stick with. Now, if you have to have a more notable selection, I do enjoy the Balvenie rum cask 14 year old, but there is a bigger scotch world to explore! Great recommendation, I am familiar with Glenfarclas but I haven’t seen that particular expression yet, thanks for sharing it. I think I’m a newbie too, I think it’s good to be a newbie because then the whole world is available to you! Thanks ever so much for the response. Glenfarclas is a purely family owned business and not part of any foreign owned conglomerate. In fact if you write the distillery I believe George who is to inherit the distillery will personally respond to many inquiries. I had a question and he responded nearly immediately. Personally that family sense really instills confidence, in me anyway, that the product is beyond reproach. Glenfarclas 15 as it turns out, is a UK only release. According to the owner the Glenfarclas 12, 17, and 25 are the mainstays of the US market. While he said he gets a lot of business from us here in the states, he admits his sales numbers are small here, but those Americans who do fancy his product remain loyal clients. Anyhow if you look many places on the internet including sales sites from the UK and internationally in general, the marks given the Glenfarclas 15 are in the low to mid 90’s depending where you look. I was so disappointed to hear that was the case, but alas, my wife has a cousin whose family lives in London and of course that is the UK. I am so smart. Also a gift was given to me for my hip recovery which just so happens was a bottle of Glengarioch 12. In Gaelic it is just Glengeery if you will, but I would suggest that if you like single malts with character and flavor, and 48% ABV Non Chill Filtered, then I think you would really enjoy . I can’t describe it too well because my senses are dulled a little, but it could be described as thick, floral, peaches both in the nose and in the taste though the taste is a long smooth finish and it is thicker if that makes any sense. Certainly one to review when you get the chance! And being a newbie has its benefits because it is all learning and trying and seeing for yourself how the journey plays out. One vid I saw had a reviewer state that it is not anyone else’s taste. It is your taste, it is your whisky, don’t close your mind and do with it what you will. Quite prophetic if I say so myself! Mike – thanks again for the recommendations, I’ll keep a look out for Glengarioch too. I’m always eager to try something new! I love that Glenfarclas is family owned, not because I dislike conglomerates but I do enjoy the romance of a family owned business. My favorite scotch is Laphroaig. Favorite scotch is laphroig (sp) but i need some glasses to taste it in!!! Lagavulin 12, but it’s really hard to name a favorite. I love all the peaty malts. I thoroughly enjoy both this site and the newsletter which are informative and entertaining. My preference is single malt and Glenmorangie 18 year old is my favorite. My husband is the scotch fan in our house, but I had Laphroaig (18 year)and loved it. I also had their 10 year and enjoyed it. My favorite is Black Label. Ardbeg is pretty tasty too! So far Wild Turkey 101. My favorite depends on how I feel at the time. Mortloch 16 and Tomintoul 14 are really nice, but for a change, I also enjoy Laphroig triple cask. I have always been a Jack Daniels fan. Smooth and mello TN whisky. My current favorite is Glenmorangie Quinta Ruban- I think it’s very nicely balanced and pretty affordable. I seem to prefer single malts, but I certainly won’t walk away from a nice blend. I’ve almost finished a bottle of Peat Monster, which was almost shockingly peaty, but surprisingly drinkable! Here’s to whisky where ever we find it! Never tried Peat Monster but I’m with you on Quinta Ruban… love it. 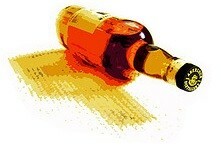 My favorite Bourbon is Knob Creek. I know its kind of a common one, but its really good stuff. I also just got a bottle of Corner Creek Reserve and am really enjoying that once a little water is added! My favorite scotch is Aberlour. I’ve only had it once but I can’t wait to have it again! Just bought The Balvenie Tun 1401 Batch No. 9 and it was all it was supposed to be and more. I also like Highland Park 18 and just tried Blantons Single Barrel Bourbon, also very good. My current favorite is Jefferson’s, but I’ve not tried much. My favorite scotch is Dalmore. Especially their cigar scotch. So hard to find though. Also a good bang for the buck is Aberlour. I tried a new (well, new for me) scotch a couple of weeks ago called Spinniker 12. I enjoyed it. I also have enjoyed Talisker 12 recently. I like many, but Lagavulin 16 is my favorite.